limited only by the imagination. For the discerning adventurer, the Oceania 75 delivers on every level. 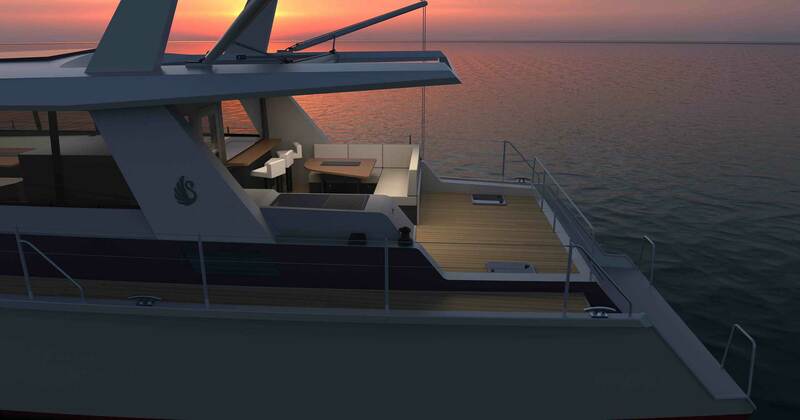 The Oceania 75 is the most comfortable, capable, and efficient vessel of its size. 75 feet in length, yet the characteristics of the Oceania 75 allow it to be comfortably managed by a couple. Dockside or at sea, the Oceania 75 provides the platform for an entire family, accommodation of guests, and entertainment aboard. Whether you imagine the vessel for holiday, seasonal, or year-round use, the Oceania 75 will provide the platform and the world’s oceans your playground. With three spacious cabins and heads aboard the Oceania 75, there is long-term comfort and convenience for up to six. 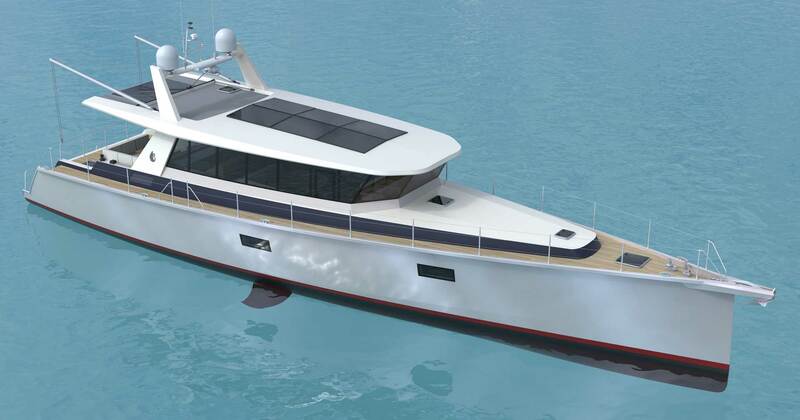 Add the optional convertible dinette and crew cabin, and there are berths for ten. Generous living spaces in the interior and on deck ensure a vessel that can serve many functions well, while prioritizing safety of operation at sea. The aft deck area is equally important to the livability of the vessel, providing spacious outdoors lounging, playing, and entertaining. 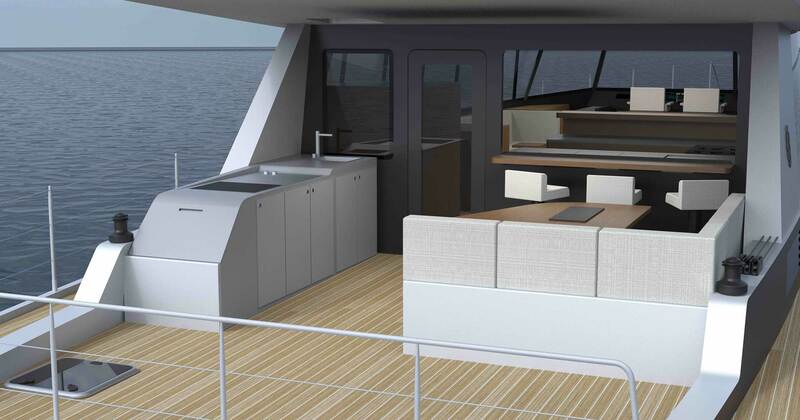 A drop down window between the galley and aft deck allows Al fresco dining, with optional enclosure allowing four-season use of the space. The Oceania 75 owner enjoys all the luxuries of home, with full galley consisting of induction cooktop, speed oven, dishwasher, spacious refrigerator and freezer drawers, and plenty of drawer and pantry storage. HD TV in the saloon, full size washer and dryer on lower deck, and water maker, are standard. Primary systems aboard the Oceania 75 are purposefully engineered to be kept simple and remove as much complexity as possible for a vessel of this size and capabilities. The large machinery and systems areas allow visual and physical ease of access for inspection and service. Standard engines, generator, batteries, inverter/chargers, stabilizer gear, water maker, water heater, and vessel heating and air conditioning – are all installed with simplicity and ease of use and maintenance as priority. 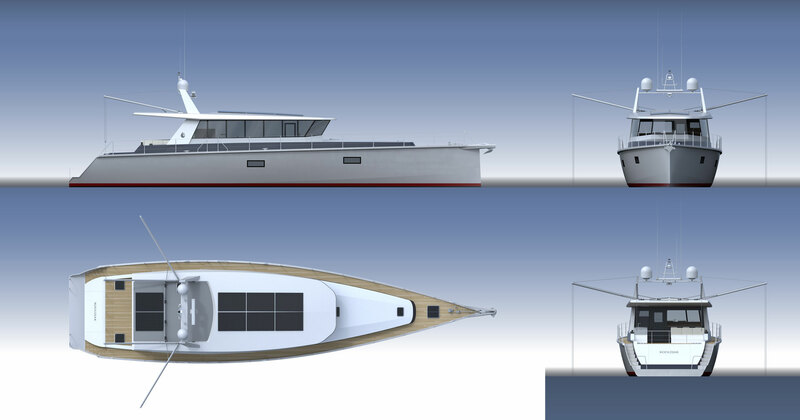 The Oceania 75 employs over 2500W of solar panels as a standard feature, contributing behind the scenes to allow a more efficient and easier to manage vessel. 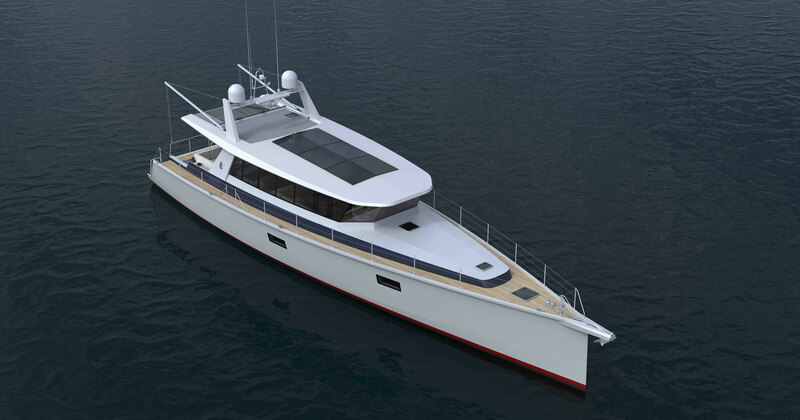 This allows the Oceania 75 to be much less generator dependent at anchor, and operate the majority of time under power, generator free – even when running galley appliances or air conditioning. The Oceania 75 stern sports a large, safe, and easy to access swim step with a proper dinghy garage incorporated into the transom. The hydraulically opening garage door is sealed to ensure security at sea, with the self-draining storage area able to accommodate a 13ft./4meter dinghy with outboard. A single person utilizing the standard rail and roller system is able to launch and retrieve the dinghy safely and with ease. Few tasks are as daunting as close quarters maneuvering and docking. With near 360° sight lines from the main helm and a side access door to starboard of the helm, the helmsperson can make quick and easy decisions and clearly communicate action or intent to line handlers and those on deck. Optional wireless remote control of engines and rudders can allow a skilled skipper even further ease of operation. The Oceania 75’s capabilities and beauty are only fully realized if the vessel is easy to use and maintain. In both the operation and upkeep, an overly complex or difficult to manage vessel will result in a boat tied to the dock. 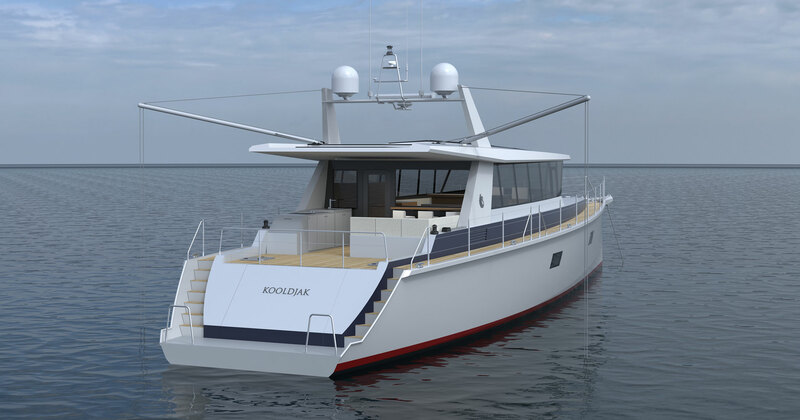 The crew of Kooldjak Marine have spent their careers in the design, installation, and support of systems specific to passage making vessels where demands and expectations are at their highest. Removing or minimizing complexity is a priority. It shouldn’t require an engineering background to understand and manage the vessel. If a system or operation cannot be managed by the non-technical minded it is likely too complex. Fill out the following form to receive full specifications, pricing, availability and more.